This week’s pick is the 'Porthole' handbag, ($195), by Neal Decker. 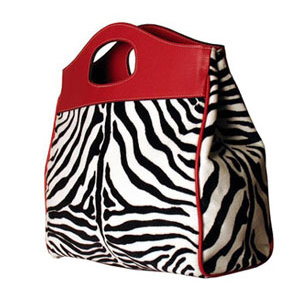 Decker couples vintage with modern – soft zebra print velour fabric is paired with Italian cherry leather trim and a mod circular cutout handle. This easy, breezy outfit is a versatile look for both work and play. Pair it up with the (Product) Red iPod Nano to contribute to a good cause. (A portion of the proceeds will go to the Global Fund to fight AIDS in Africa).